The political history of the twentieth century can be viewed as the history of democracy’s struggle against its external enemies: fascism and communism. This struggle ended with the fall of the Berlin Wall and the collapse of the Soviet regime. Some people think that democracy now faces new enemies: Islamic fundamentalism, religious extremism and international terrorism and that this is the struggle that will define our times. Todorov disagrees: the biggest threat to democracy today is democracy itself. Its enemies are within: what the ancient Greeks called 'hubris'. Todorov argues that certain democratic values have been distorted and pushed to an extreme that serves the interests of dominant states and powerful individuals. In the name of ‘democracy’ and ‘human rights’, the United States and some European countries have embarked on a crusade to enlighten some foreign populations through the use of force. Yet this mission to ‘help’ others has led to Abu Ghraib and Guantanamo, to large-scale destruction and loss of life and to a moral crisis of growing proportions. The defence of freedom, if unlimited, can lead to the tyranny of individuals. 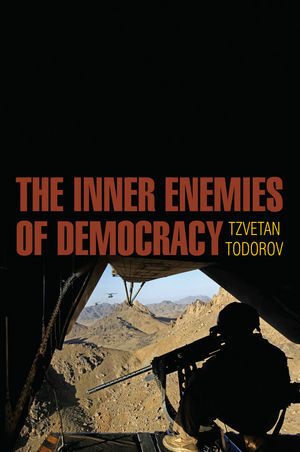 Drawing on recent history as well as his own experience of growing up in a totalitarian regime, Todorov returns to examples borrowed from the Western canon: from a dispute between Augustine and Pelagius to the fierce debates among Enlightenment thinkers to explore the origin of these perversions of democracy. He argues compellingly that the real democratic ideal is to be found in the delicate, ever-changing balance between competing principles, popular sovereignty, freedom and progress. When one of these elements breaks free and turns into an over-riding principle, it becomes dangerous: populism, ultra-liberalism and messianism, the inner enemies of democracy. Tzvetan Todorov is Director of Research at the CNRS in Paris. One of the great intellectuals of our time. This is a voice to be listened to attentively, for our shared planetary home's and all its residents' sake. Now, of all times, there is a need for cool heads, such as Todorov, who approaches the limits of free speech with admirable dexterity. A coherent, relevant work in which intelligence and sincere humanism do battle Ð a world away from the slippery moralizing of intellectual fence-sitters. Todorov’s work is that of a sage, a man who has read the great texts, who has lived through two political regimes, and who dares to express an idea that may seem at odds with his fervent defence of freedom and democracy: freedom for its own sake, freedom that forgets its duties and responsibilities, is self-destructive. What he writes is never ordinary, but always tolerant and life affirming.